Asking readers not to think about World War II in a book about the rise of Hitler is a tall order. 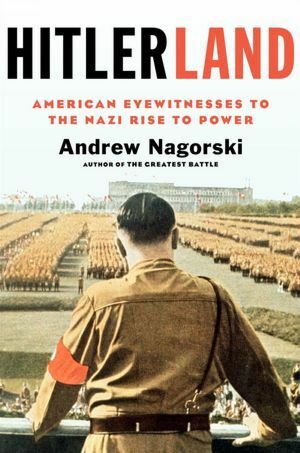 But if you can read the public and private correspondence of American diplomats and journalists in Berlin between the wars as they were written—as contemporaneous commentary—Andrew Nagorski's Hitlerland is not only compelling, it is a warning. Nagorski reminds us, "The unfolding of history only looks inevitable in retrospect," and "in retrospect" is how we learn. As the United States and its allies contemplate the war between radical Sunni expansionists and radical Shiite expansionists as it affects the Middle East and the West, Hitlerland has lessons. The inter-war period of the 20th Century was a Golden Age for American journalists in Europe, and Berlin was the best seat in the house. Every major newspaper and radio station had a foreign correspondent. Dorothy Thompson, William Shirer, Bella Fromm, Howard K. Smith, Sigrid Schultz, S. Miles Bouton and others lived well and cultivated close social and working relations with American diplomats and German officials. Ernest Hemingway, Sinclair Lewis and Thomas Wolfe dropped in. They began to arrive in the early 1920s, and they saw the privation of war, and the depression and chaos born of defeat. Ben Hecht, still a future star, wrote to his editor at The Chicago Daily News, "Germany is having a nervous breakdown. There is nothing sane to report." Edgar Mowrer of The Chicago Daily News and his wife Lilian confessed to puzzlement over aspects of German behavior, such as the 150,000 organized German nudists about whom they wrote. Lilian Mowrer was troubled by the "loose emotional fervor" and "ardent yearning for something 'different'" among the nudists and concluded that their feelings "could be just as easily canalized and turned in any other direction by an unscrupulous leader interested in using it for his own ends." She asked Edgar, "Do you think Germans are madder than any other peoples? They seem so unbalanced…so hysterical." "They lack coherence," he replied. "They are so rich in intellect and poor in common sense. And there is almost nothing they can't persuade themselves to believe." "I am impressed by the vitality and sweeping enthusiasm of the Hitler movement, its idealizations, its emotional fervor, its revolutionary aspects. They certainly are swayed by an idea, no matter how ludicrous it may seem to us who have no idea to live for. I envy the fascists, the nationalists, the communists, all those who are working for something to be realized." But where Abel envied what he thought was idealistic fervor, Mowrer was watching the hard work of the Nazi party. "While others slept, they had labored. While opponents talked once, they talked ten times. Hitler believes chiefly in the personal contact, the spoken word, personality. In the great game of fooling the public, he is an incomparable master." Mowrer was asked sardonically, "and when are you coming back to Germany, Herr Mowrer?" "Why, when I can come back with two million of my countrymen," the correspondent replied. It took a moment for the official to absorb the import of his statement: Mowrer was envisaging a day when American soldiers would march into a defeated Germany. "Aber nein." "Impossible," the official protested loudly. "Not for the Fuhrer," Mowrer said. "The Fuhrer can bring anything about… even that." 1. "On first glance, Germany was overwhelmingly attractive, and first impressions disarmed many a hardy anti-Nazi before he could lift his lance for attack… (This) bespeaks the sensitivity of a rhinoceros's hide and the profundity of a tea-saucer." 2. Stage Two is noticing "the amazing extent to which Germany, even then, was prepared for war," but finding the militarism "downright exciting." 3. In Stage Three, "You begin to grasp that what was happening was that young humans, millions of them, were being trained to act merely upon reflexes…to kill as a reflex…to smash, crush, destroy, wreck." 4. Stage Four is characterized by "a strange, stark terror." Stage Four, Smith wrote, was accompanied by fear that the world had no idea what was coming. Smith saw Nazism as "a real, direct and imminent threat to the existence of a civilization which gathers facts and discusses." The democratic world, in his view, was "admirable and weak," while Hitler's world was "mighty, powerful, reckless. It screamed defiance at my world from the housetops. One had to be deaf not to hear it." Deaf, pro-Nazi or unwilling to believe that Hitler meant what he said. The belief that Hitler could be "turned" or controlled was common in German government circles in the early 1930s—as was the belief that if accommodation with Hitler couldn't be found, Germany would fall prey to "real radicals" with whom it would be impossible to do business. Chancellor Kurt von Schleicher, Vice Chancellor Franz van Pappen ("We have hired Hitler"), union official Martin Plettl ("Hitler is a 'cats paw' to get rid of the communists"), and Hans Dieckoff who later served as German ambassador to Washington, all told journalists and other Americans that Hitler was under control and/or would be moderated. At a party in 1932, German-born Jewish journalist Bella Fromm asked Schleicher "What about the church and Jew-phobia of the [Nazi] party?" "You ought to know me better than that, Bella," Schleicher replied. "All that will be dropped entirely." Reichsbank President Hjalmar Schacht told Mowrer, "Ach, you understand nothing. You are a stupid American." Mowrer replied, "Granted. But tell me what you expect from Hitler in words of one syllable and I'll try to understand." Schacht said, "Germany will have no peace until we bring Hitler to power." Three weeks later, Schacht told Mowrer, "I've got that man right in my pocket." Americans, too, had faith in the ability of the U.S. to move the Nazi government. William Randolph Hearst told his reporter Karl Henry von Wiegand, "Do not be displeased with (those) in the Government who seem antagonistic. Give them good advice and try to guide them toward a greater liberality which will gain approval both at home and abroad." Some who understood the dangers of Hitler still wanted to keep the United States on good terms with the Nazi government. Most, including notorious America First-er Charles Lindbergh, were not oblivious to the dark side of Germany. The section on Lindbergh's work for the U.S. government was a revelation. At the request of Military Attaché Truman Smith, Lindbergh wangled several invitations from the German government to visit air corps factories, training grounds and bases. He wrote detailed intelligence reports that Smith passed along to Washington. Anne Lindbergh wrote that the unity of the Germans could be terrifying as "a weapon made by one man but also used by one man." She called Hitler "an inspired religious leader, and as such fanatical" and noted that she disliked "their treatment of the Jews, their brute-force manner, their stupidity, their rudeness." In an optimistic reversal of Lilian Mowrer, she concluded, Germany "could be a force for good in the world" if only the world would turn Germany's rulers "in the right direction." Still others believed the internal affairs of Germany were not the business of the United States and not subject to moral or other American judgments. Former President Herbert Hoover wrote precisely that. "The forms of governments which other peoples pass through in working out their destinies is not our business." The last U.S. Ambassador in Berlin, Hugh Wilson, agreed. "I wish our people in general could understand how little is gained by scolding other people, and how much is gained by trying to work with them." It was Wilson who, upon the completion of the Anschluss in 1938 wrote in his diary, "One may judge the action from the moral point of view with condemnation. One may deplore the brutality of it. One must admire the efficiency of the action." Hitlerland is important for what amounts to time travel. The Americans in Berlin between the wars were the proverbial frog in the pot of water on the stove—they could feel it getting hotter, but not until later did they know the gas was (literally) on. With the benefit of hindsight, we can understand some of the misinformation, misunderstandings and misjudgments. A few were simply pro-Nazi and more than a few didn't care for Jews. But Hitlerland is also important because there were heroes and patriots. From Mowrer, Smith, Shirer, Schultz, Fromm and others, we can take lessons to guide us in understanding the great totalitarian movement of the early 21st Century—radical Islam in both its Sunni and Shiite forms. There are no "moderate fascists." Unarmed political forces cannot control armed fascist movements. If you have two enemies and use one to eliminate the other, the one who survives will not submit meekly to your program; he will insist upon his. Winning elections, sham or otherwise, will not moderate immoderate people. When immoderate people win, read their manifesto. They took power to be who they said they would be and to govern as they said they would govern. People can attach themselves with great fervor to movements without regard for the fascist underpinnings of those movements. Their fervor is not something to admire. It is something of which to take account because they will be told to do fascist things—and they will do them with fervor. Admiration for "efficiency" separated from morality is immoral. With the German declaration of war, the journalists and diplomats were rounded up and sent to an unused resort to wait in cold, boring desolation for repatriation. 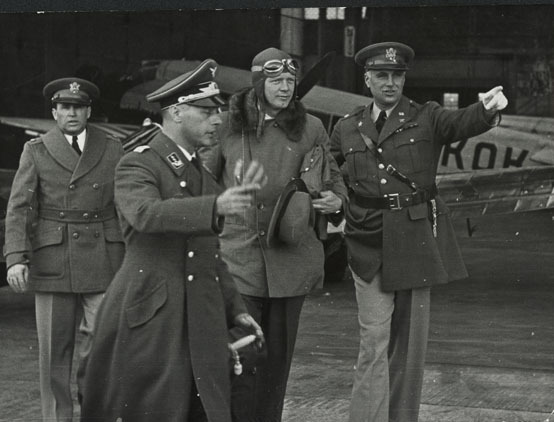 When they finally moved from Germany to Lisbon and then to New York, Angus Theurmer, a junior AP reporter, wrote: "Yes, for us there was an end to the pall of the Geheime Staatspolizei (Gestapo). We were lucky. We happened to be foreigners, American foreigners." It is not our space. Americans can go home, but both victims and their oppressors remain after us, their fates inextricably linked. Shoshana Bryen is a political analyst and essayist who writes for InFocus Quarterly and the Jewish Policy Center.